There’s no denying that the food truck movement has essentially exploded as of late. Want fusion tacos (badÂ and good)? Want grilled cheese? Or a banh mi sandwich? What about dim sum or even red velvet pancakes? The menus are vast – but as of now, the food truck explosion has expanded toÂ include benefitting a good cause. St. Vincent Meals On Wheels, the Los Angeles-based chapter of Meals On Wheels, is launching an initiative tomorrow in the form of yet another food truck. This time, the truck rolls out once a week and the menu will be rotating as will the chef. 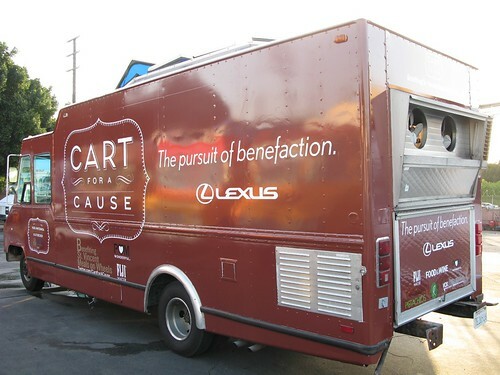 Gourmet meals featuring a preeminent Los Angeles-area chef will be rolling out on the Cart For A Cause (@cartforacause) every Tuesday through fall. Tomorrow, Executive Chef Alex Becker of Nobu West Hollywood will be on showcase as 100% of the proceeds of the $10 lunches – which include drinkÂ -Â benefit St. Vincent Meals On Wheels. On Tuesdays to come, you can look forward to specially made menu items by confirmed chefs including Susan Feniger (STREET), David Myers and Dong Choi (Comme Ã‡a), Vinny Dotolo and Jon Shook (Animal), Josef Centeno (Lazy Ox Canteen), Eric Greenspan (The Foundry), Nicholas Peter (Little Door) and Sal Marino (Il Grano). Satisfying your penchant for food truck chasing while helping to deliver nutritious food and love to Los Angeles’ home-bound seniors? Seems like a win-win charitable cause to me. This entry was posted in Beverly Hills, charity, Deals, Food and tagged $10, @cartforacause, Alex Becker, Cart For A Cause, food truck, Meals On Wheels, Nobu West Hollywood, St. Vincent, St. Vincent Meals On Wheels. Bookmark the permalink.